I was shocked to see that there was a partition on my internal drive called Linux Filesystem. I would appreciate it if someone could inform me as to what both the Linux Filesystem volume is doing on disk0 and what the VM volume is on disk1. For some clarification: I did used to have a VirtualBox machine on my Mac running Linux but I thought that everything was correctly uninstalled. Therefore, I would like to remove any possible remnants which have persisted. Even if these are the result of the VirtualBox, I do not understand how the Linux Filesystem volume has been integrated into disk0; surely it should've been contained by VirtualBox? While it is possible to create a virtual machine that uses a physical partition, this is only done by experienced VirtualBox users. In any case, since you have removed your Linux virtual machine, then you probably do no longer need this partition. 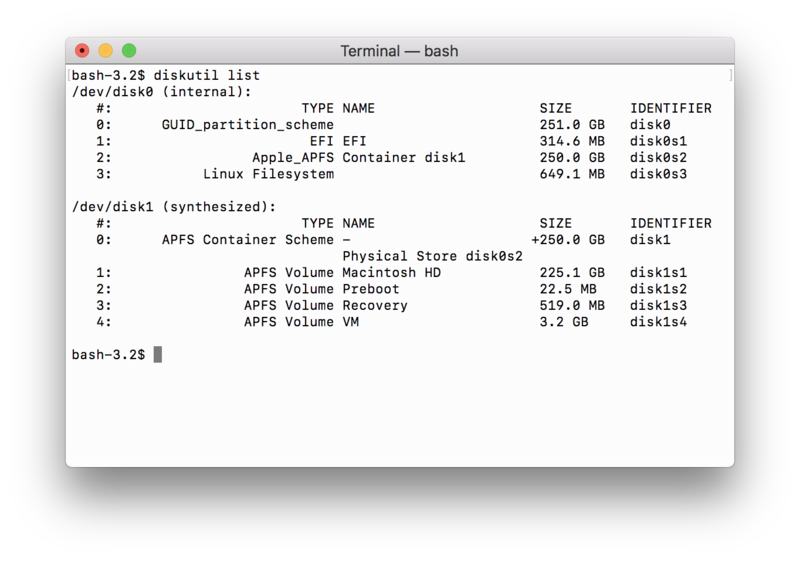 If you open a Terminal application window and enter the following commands, this unneeded partition will be removed and the free space added back to macOS. The VM volume on disk1 has nothing to do with VirtualBox. The letters VM stand for virtual memory. This is the swap space used by macOS. The macOS operating system, installed on your Mac, uses 4 different volumes to operate. These volumes are stored in the partition named disk0s2 on your physical drive disk0. This partition was given the container name disk1. The name disk1 implies a drive, but this is just the naming convension chosen by Apple. So disk1 is not drive, it is a container for the 4 volumes used by macOS. Advice if sudo diskutil apfs resizecontainer disk0s2 0 fails. This would indicate your a problem with the software stored on your drive. You should verify the drive. The Disk Utility with High Sierra no longer allows you to verify your drive. This must be done by entering commands in a Terminal application window. Also, it would be preferable this be done from either macOS Recovery over the Internet or a bootable installer for macOS. The commands shown below can be used to verify the drive. You can determine, if a verify command was successful, by looking for either an OK message or an exit code of 0. Note: None of these commands will change your drive. The purpose of the sudo diskutil apfs resizecontainer disk0s2 0 command is to add back most free space found immediately after the container disk0s2 partition back to the partition. The command given below can print out the space allocated to your drive. Note: This command will not change your drive. Note: This command needs to be entered while in one of the Recovery modes given above. For example, the output shown below shows free space after the partition with index of 2. After entering the sudo diskutil apfs resizecontainer disk0s2 0 command, the output would appear as shown below. Not the answer you're looking for? Browse other questions tagged macos hard-drive disk-utility partition virtualbox .